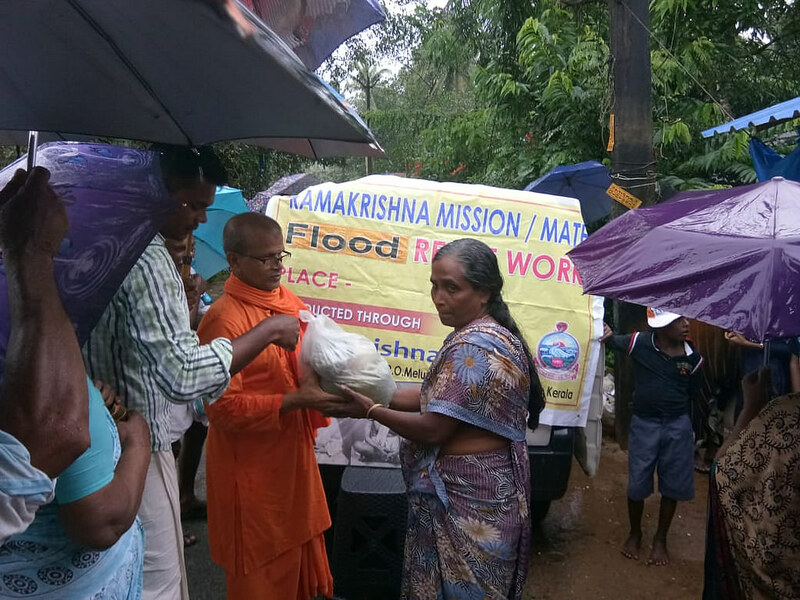 Responding to massive floods in Kerala, Ramakrishna Math/Mission centres in Kerala have undertaken large-scale primary relief work to alleviate the suffering of people from those flood affected areas. 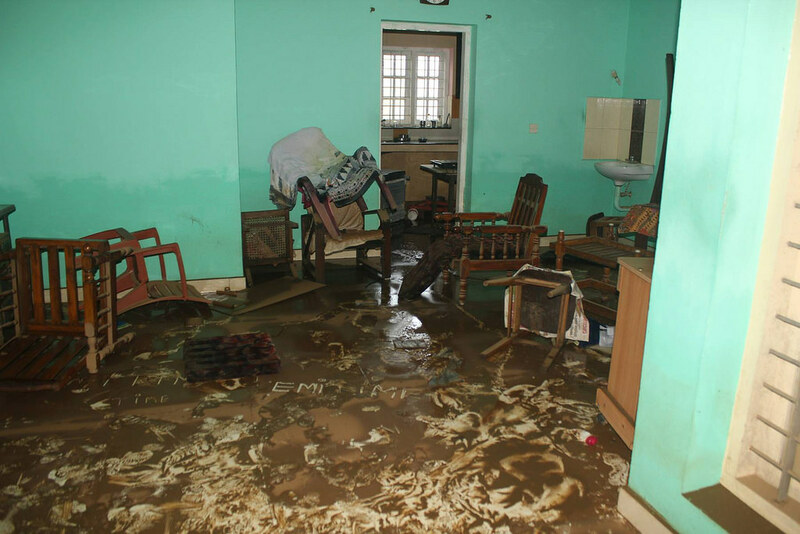 This includes providing cooked food, clothes and essential commodities. 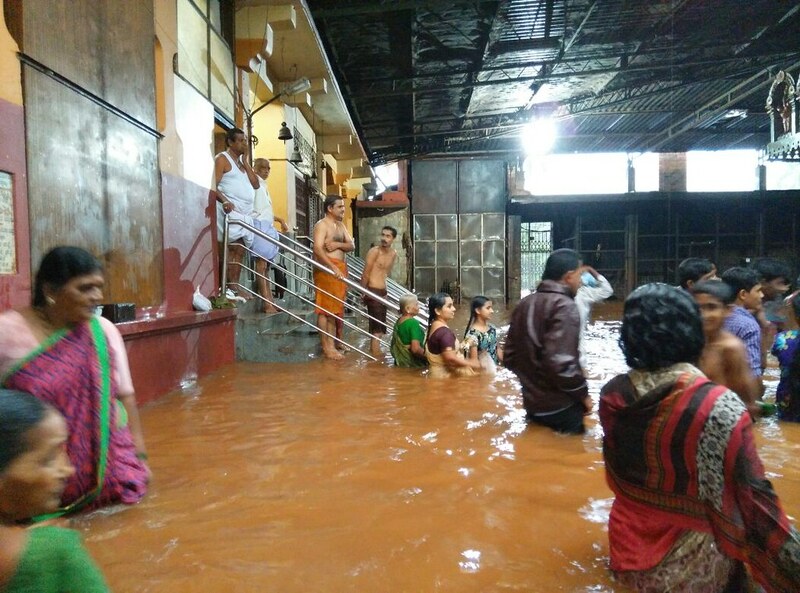 Many sufferers whose houses have been inundated by the floods have taken shelter in our Math premises. 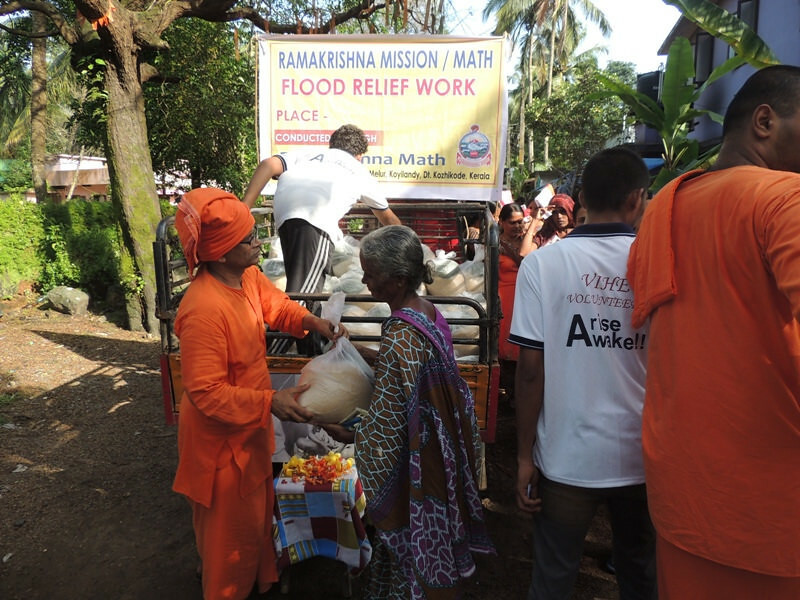 Ramakrishna Math Chennai on behalf of the Kerala centers is accepting Online Donations to facilitate people from distant places wishing to donate to this noble cause. We seek your generous support in this regard. All donations will be duly acknowledged and are exempt from income tax. 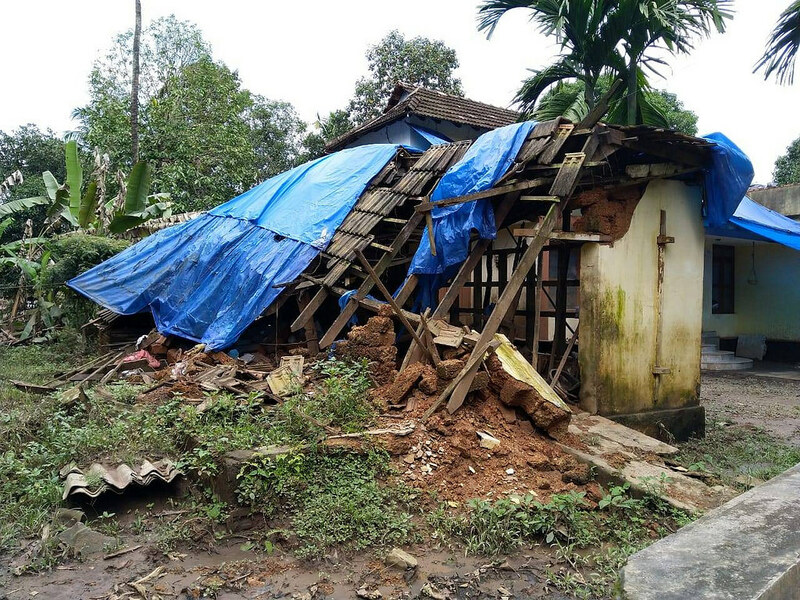 കേരളത്തിലെ പ്രളയ ദുരിതാശ്വാസ പ്രവർത്തനങ്ങൾ നമ്മുടെ രാമകൃഷ്ണ മഠം കേന്ദ്രങ്ങൾ (തിരുവല്ല, കാലടി, കൊയിലാണ്ടി, വൈറ്റില) വൻതോതിൽ ഏറ്റെടുത്തുകഴിഞ്ഞു. 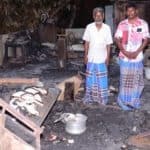 പ്രളയക്കെടുതിയിൽ ദുരിതമനുഭവിക്കുന്നവർക്ക് വേണ്ടി വിഭവസമൃദ്ധമായ ആഹാരം, വസ്ത്രം, അവശ്യ സാധനങ്ങൾ എന്നിവ വിതരണം ചെയ്യുന്നതിന് പുറമെ വീടുകൾ നഷ്ടപ്പെട്ടവർക്ക് ഞങ്ങളുടെ സ്ഥാപനങ്ങളിൽ താൽക്കാലിക താമസ സൗകര്യവും ഏർപ്പെടുത്തിയിട്ടുണ്ട്. 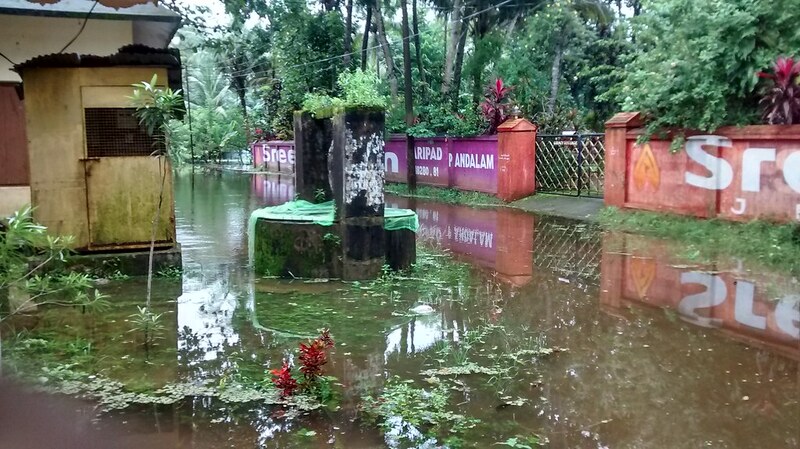 കേരള കേന്ദ്രങ്ങൾക്കുവേണ്ടി ചെന്നൈ രാമകൃഷ്ണമഠം ഓൺലൈൻ സംഭാവനകൾ സ്വീകരിക്കുന്നതാണ്. 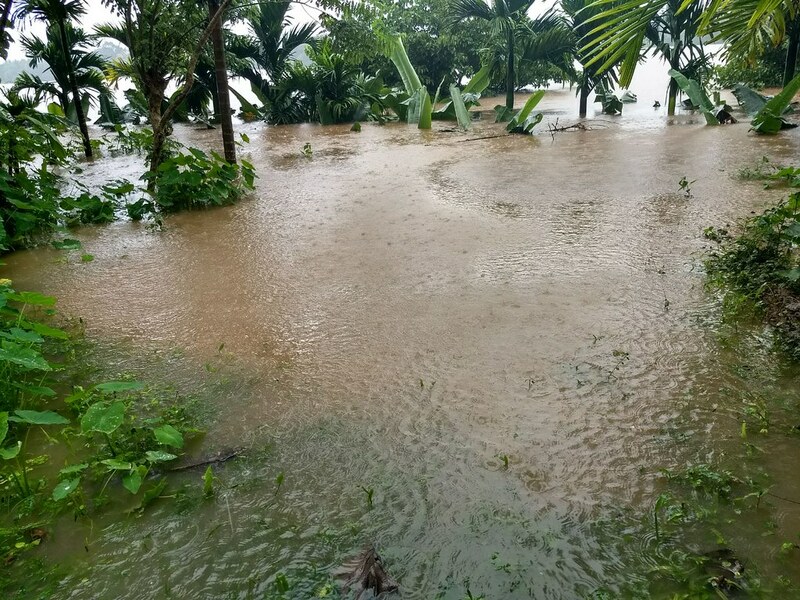 തന്നാലാവുന്ന വിധം സംഭാവന നൽകി ഞങ്ങളുടെ ദുരിതാശ്വാസ പ്രവർത്തനങ്ങൾക്ക് പിന്തുണയേകാൻ ഏവരോടും സവിനയം അഭ്യർത്ഥിച്ചുകൊള്ളുന്നു. 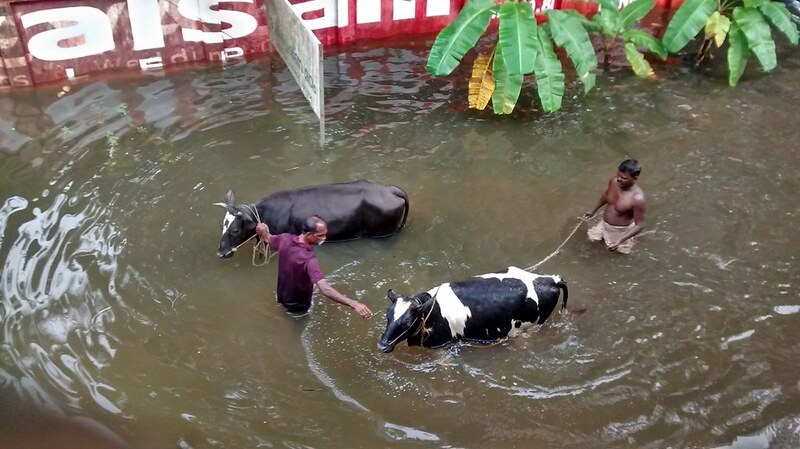 എല്ലാ സംഭാവനകൾക്കും Tax exemption ലഭിക്കുന്നതാണ്. 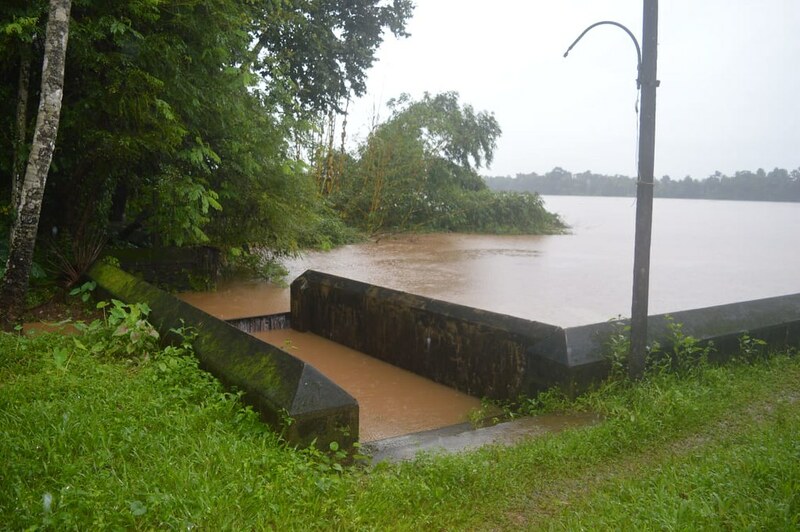 Incessant rains and flooding of the Purna river have wreaked havoc in the Ernakulam district. 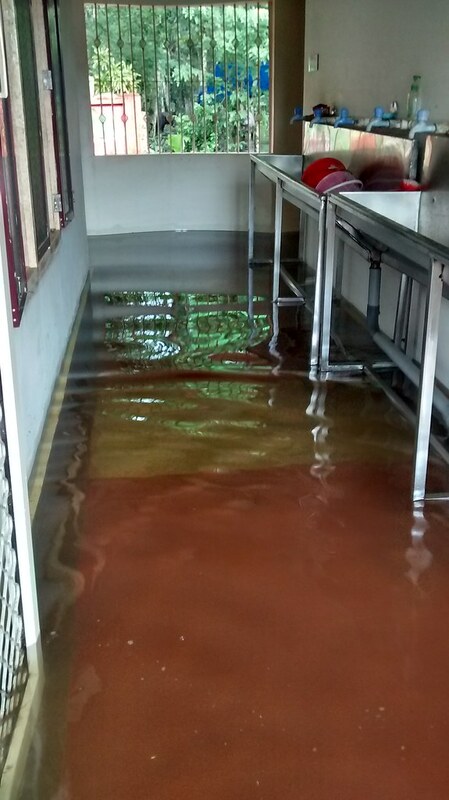 Flood waters have entered our Ashrama premises and some portions are under 3 feet of water. 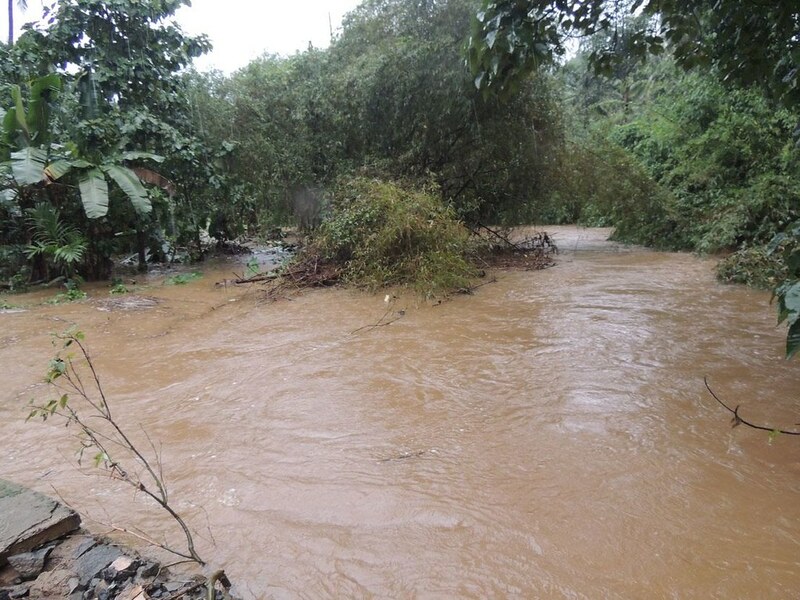 The situation has turned further grave owing to lack of electricity and connectivity. 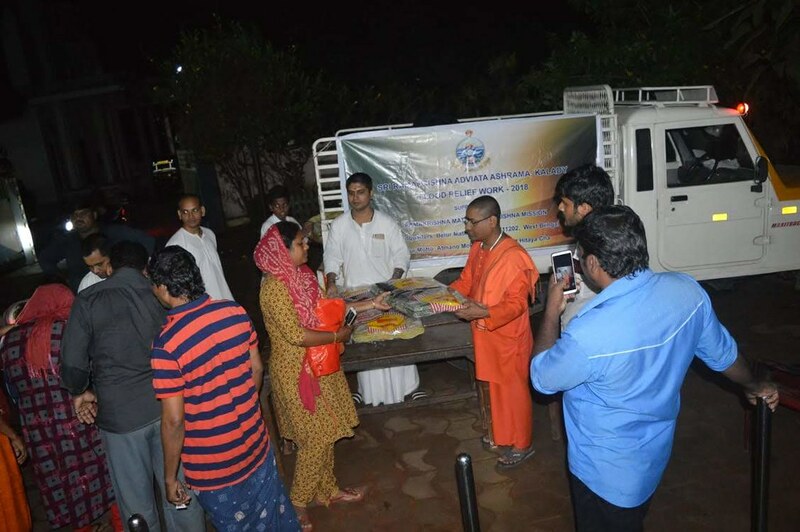 The local authorities have made the Ashrama’s school a local relief camp and more than 2800 local people are being provided food and shelter by us. 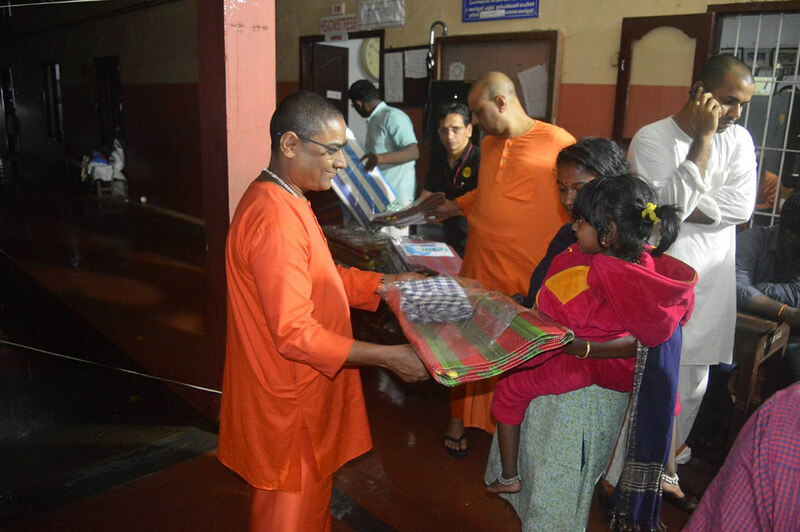 The center is also distributing blankets, mats, sanitary items, etc. 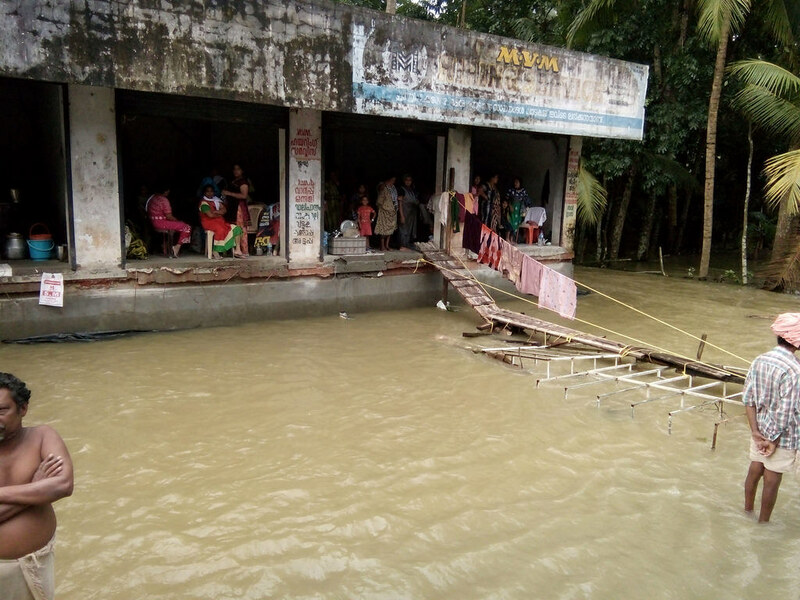 among thousands of flood-affected persons. 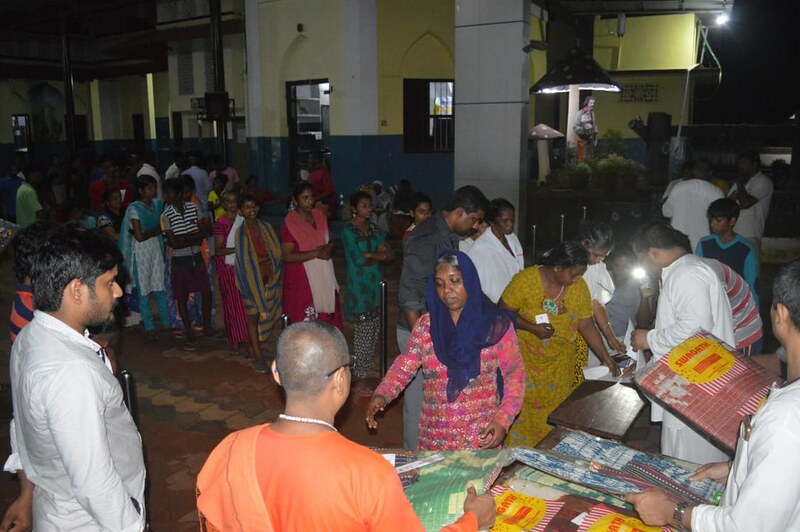 In response to the flooding of various parts of the Pathanamthitta district, Tiruvalla centre has distributed food materials among 100 flood-affected families and is in the process of distributing garments, bedsheets and mats among thousands of flood-affected persons. 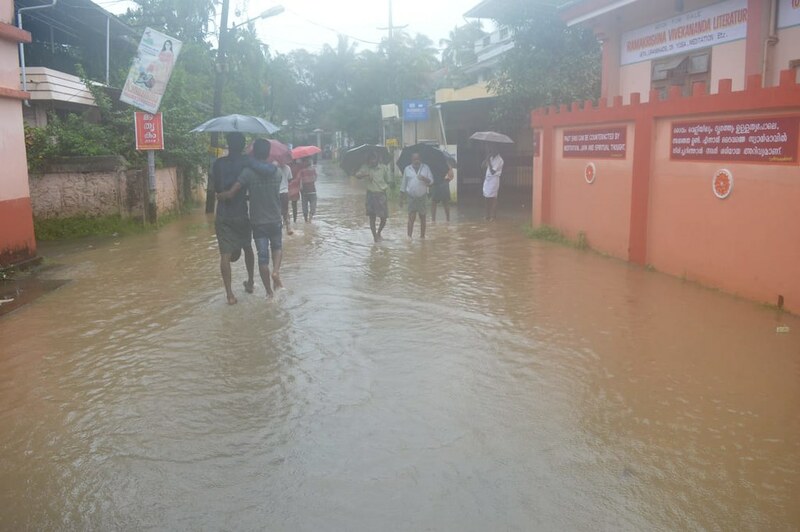 In response to the flooding of various parts of the Kozhikode district, Kozhikode center has so far distributed rice, lentils, edible oil, milk powder and biscuits among 1000 flood-affected families. 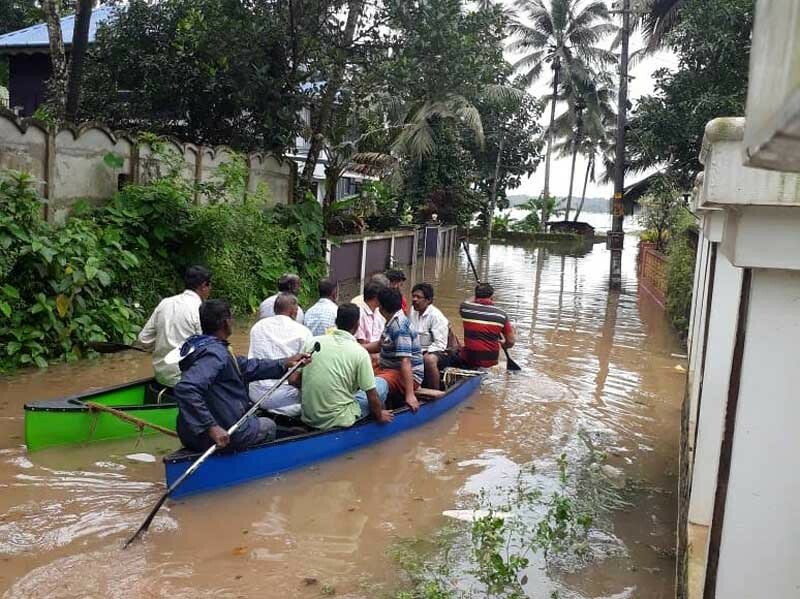 In response to the flooding of various parts of Kannur district, Koyilandy center has so far distributed 1750 kg rice and 500 kg lentils among 250 flood-affected families in the Aralam gram panchayat and is in the process of distributing garments, towels, bedsheets, drinking water among flood-affected families living in the relief camps. 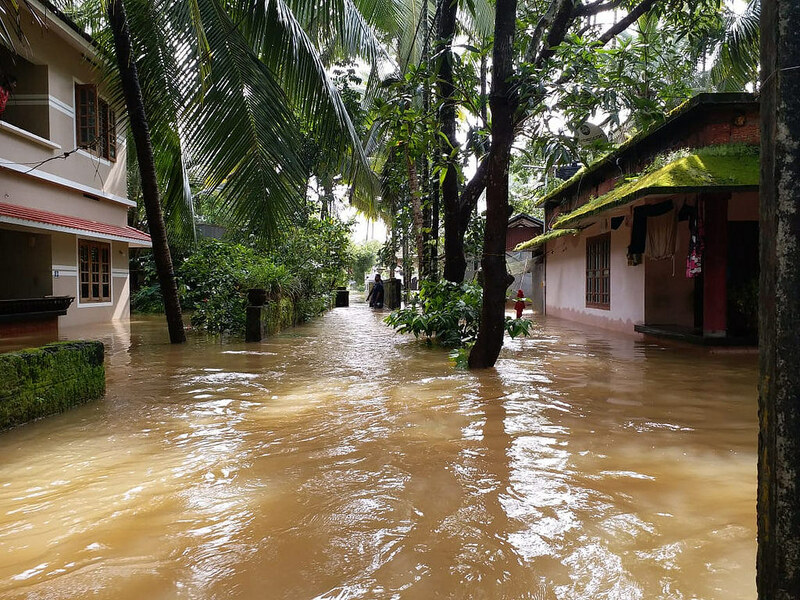 In response to the flooding of various parts of the Thrissur district, a relief camp has been opened by the Adat gram panchayat at the higher secondary school of our Thrissur centre. 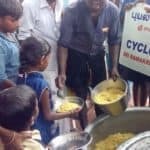 Besides providing food and shelter to 280 persons in the camp, the centre is in the process of conducting next phase of relief and rehabilitation. 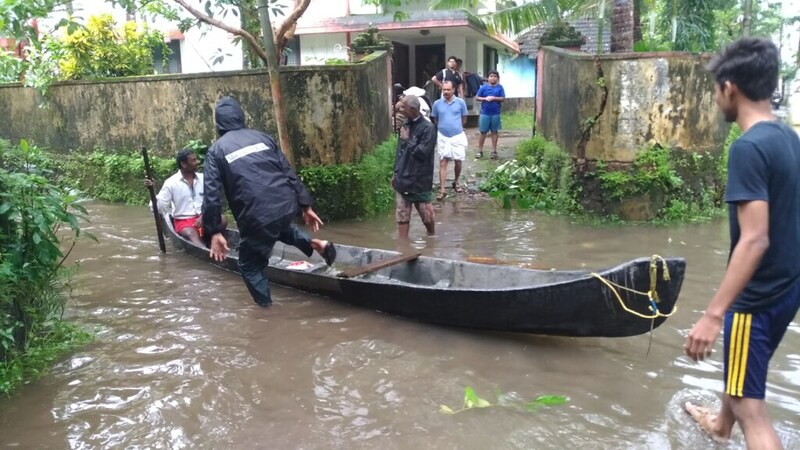 In the aftermath of the flooding of various parts of the Alappuzha district, the Kayamkulam centre is in the process of conducting flood relief services. 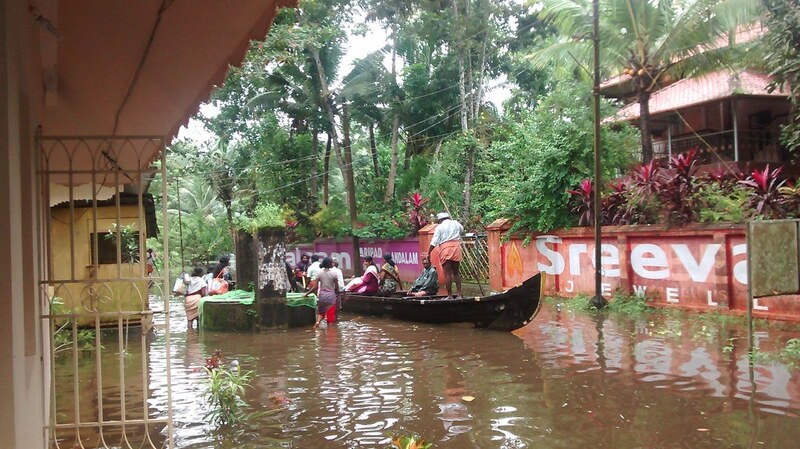 Further, on account of flooding of our Haripad centre, its monastic member have taken shelter in the Kayamkulam centre. Detailed reports are awaited. 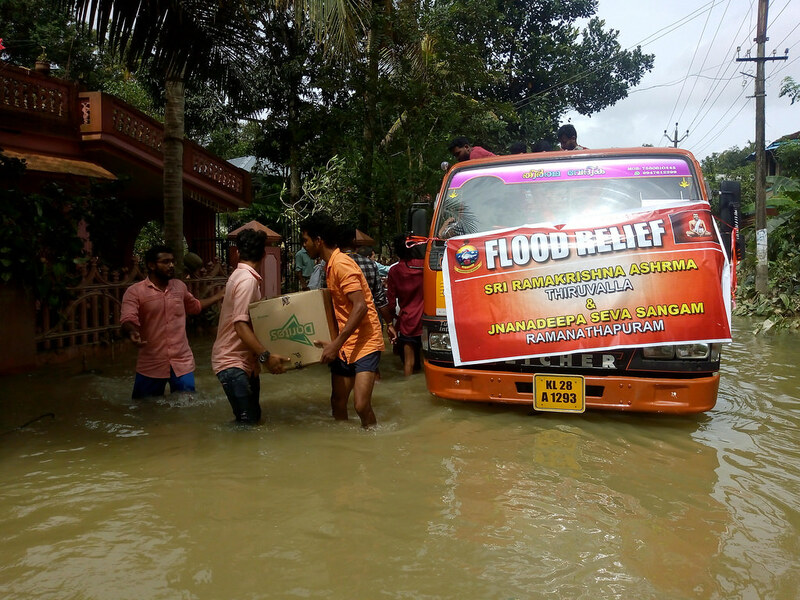 In response to the flooding of various parts of the Kottayam district, the Pala centre is conducting flood relief services by distributing cooked food, dry food items and toiletries among numerous flood-affected families residing at the nearby relief camps. 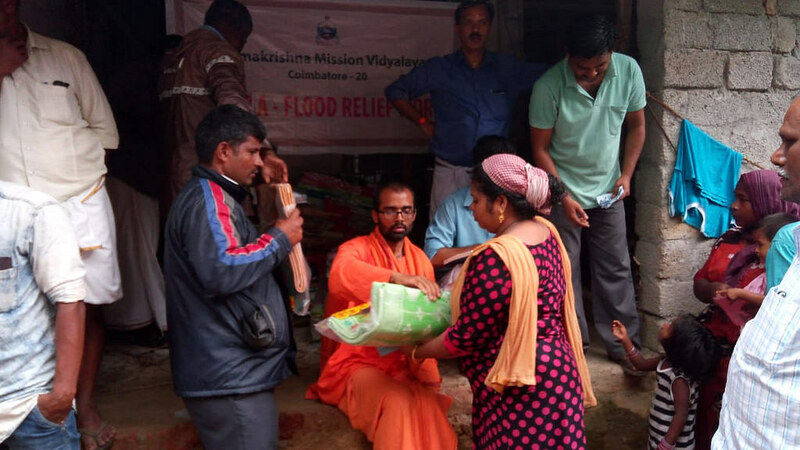 On 19 August 2018, a relief-team consisting of monastics, staff, and students of Ramakrishna Mission Vidyalaya, Coimbatore, visited flood-affected interior villages of Palakkad district, Kerala, and distributed plastic mats and blankets to the needy in various relief camps. 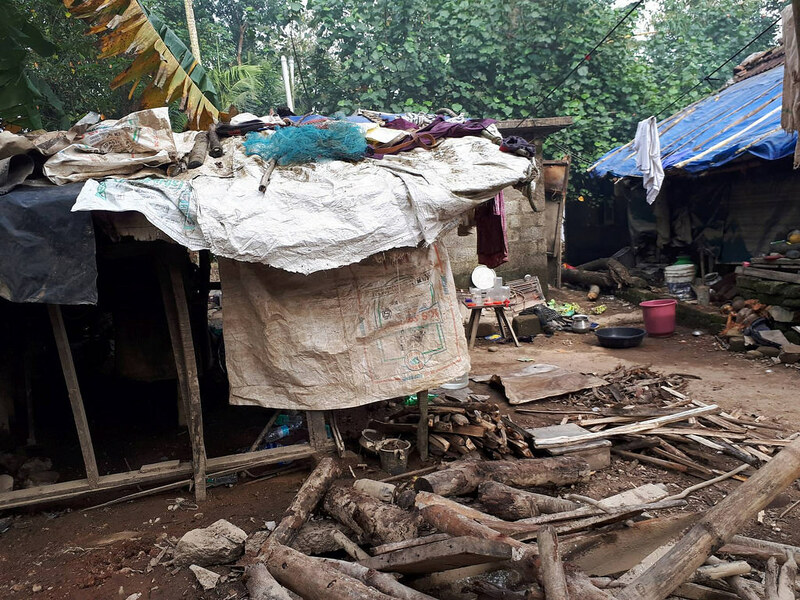 Apart from food and drinking water, blankets and mats were very much in need for the flood-affected families, whose most bedding materials were wet and unusable. 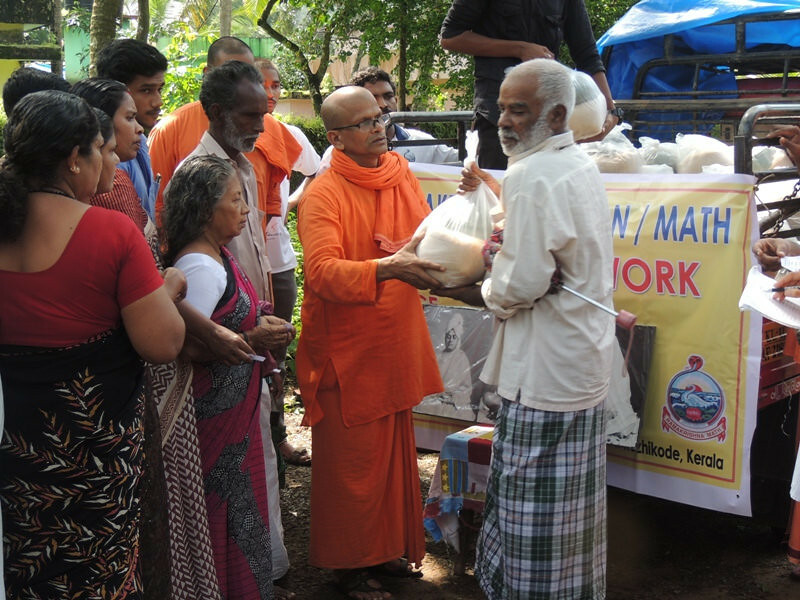 As part of the on-going relief work in Kerala, Ramakrishna Math, Koyilandy, distributed rice, dal and other food items, 354 families in the fishermen colony of the coastal area in Koyilandy, from 18 to 22 August 2018. 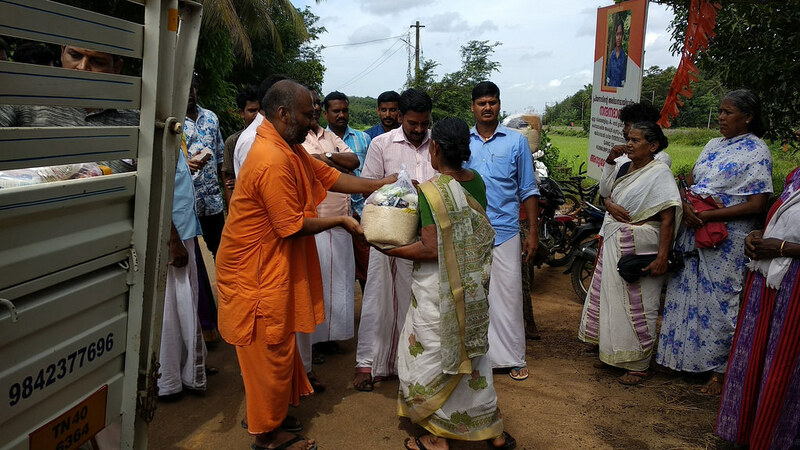 On 23 August, the Ashrama distributed rice and dal to flood-affected 155 families near our Koyilandy Ashrama. 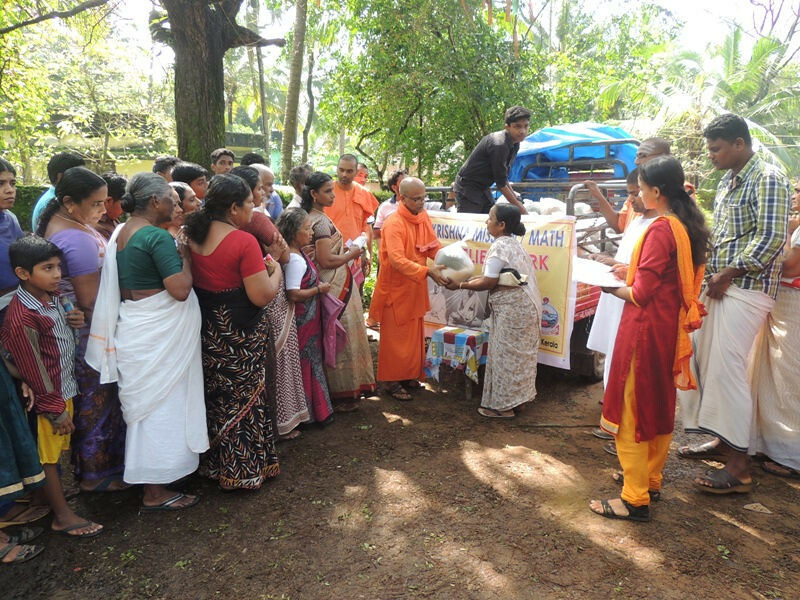 Ramakrishna Advaita Ashrama, Kalady (Kerala) continued the relief services in and around Kalady and Kanjoor panchayats. 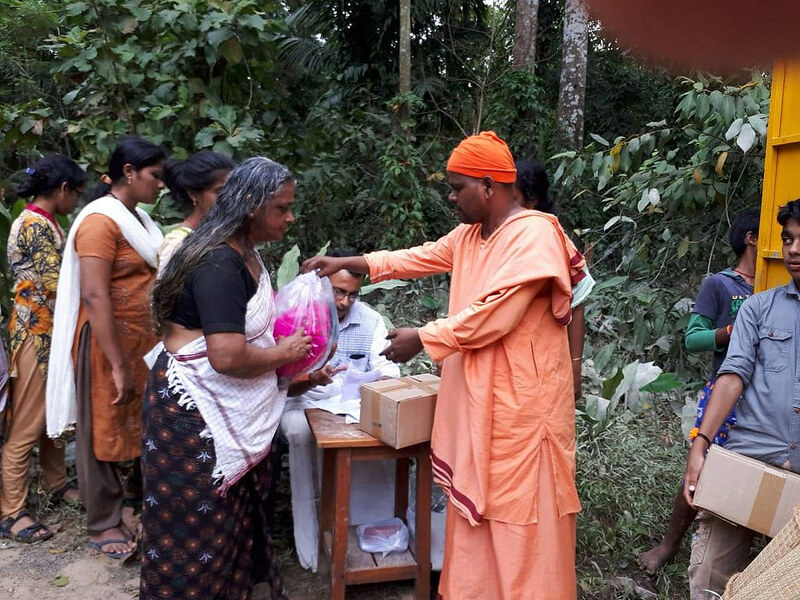 On 22 and 23 August 2018, the Kalady Ashrama distributed relief items to 1,645 families. 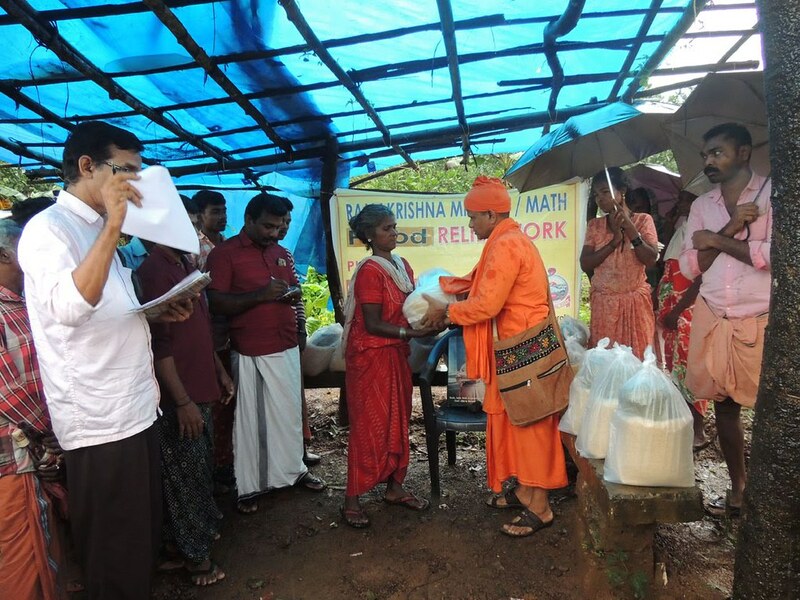 Ramakrishna Math, Coimbatore, has taken up Kerala relief services in the affected areas of Palakkad. 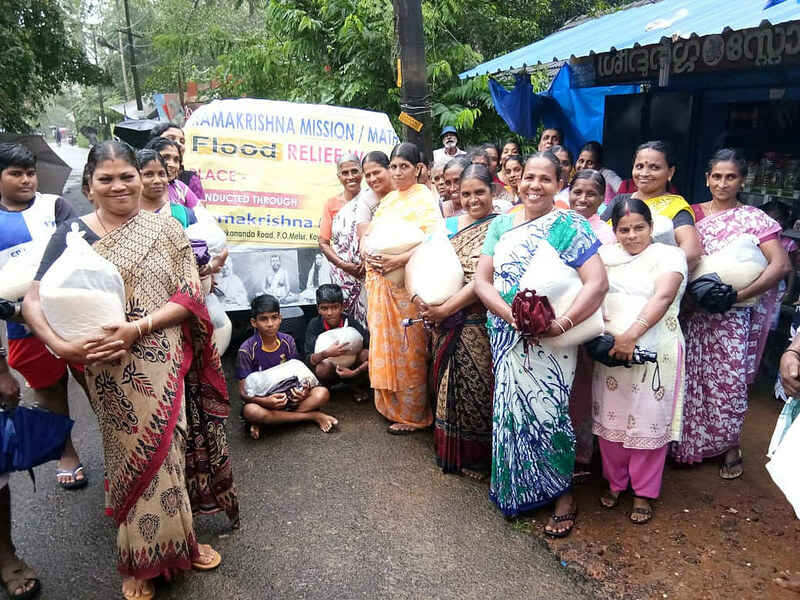 On 21 August 2018, the Math has distributed food items to 500 families in surroundings of Mazhapuzla Dam and in Ottapalam.